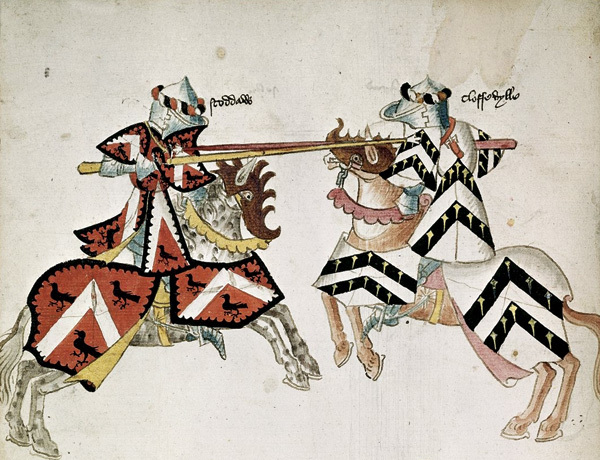 MHM looks at five of the most fearsome hand-to-hand weapons of the Medieval era. The longsword first emerged as a distinctive type of Late Medieval sword in the 14th century, in the earlier phases of the Hundred Years War. It remained in use as a weapon of war intended for wielders wearing full plate armour, either on foot or on horseback, throughout the Late Medieval period. From the late 15th century, however, it is also attested as being worn and used by unarmoured soldiers or mercenaries. By the 16th century, the longsword’s military use was limited, though it remained a weapon of choice among the German Landsknechts a while longer, and it continued to be used thereafter as a sports weapon and possibly also for duels. Designed for use by a warrior on horseback, a lance is a long pole or spear made of wood with a sharp metal tip. Although best known as a military and sporting weapon carried by European knights, the use of lances was widespread throughout Asia, the Middle East, and North Africa, wherever suitable mounts were available. Horsemen also carried swords or maces, as the lance was too long and heavy for use at close-quarters or when dismounted. Lances were still in use by the British, French, Russian, Belgian, Turkish, Italian, and German armies at the outbreak of WWI. The mace is descended from a simple wooden club. Although there were many variations, in essence the mace was a bludgeoning weapon with a wooden handle and an iron head. Because of the heavy top, a soldier could swing it without much effort, generating more force than a sword – enough to severely damage his opponent’s armour. Footmen used shorter maces, while horsemen used longer ones to reach from their greater height. Today they are used for ceremonials at American universities and in the House of Commons. The English use of massed billmen was well known in the Late Medieval and Renaissance periods, notably a er the Battle of Flodden in 1513, when the Scottish King James IV was felled by an arrow and bill. Originally used as a farming tool for clearing undergrowth, these savage bladed implements evolved into an infantry weapon. With many variations, the billhook’s handle could be short (preferred by the English) or long (for the Italians.) Used in a swinging motion, it had the stopping power of a spear, but because of the curved blade, it could also hook into the chinks in an enemy’s armour for grappling. Nasty. This two-handed weapon came to prominence during the 14th and 15th centuries. Essentially an axe, a hook, and a spike on top of a pole, it was a fearsome antipersonnel weapon for use against both infantry and cavalry. To engage other pikemen, foot soldiers armed with halberds would also carry a short sword for even closer combat. Frequently adopted by court bodyguards, the halberd is still in use as a ceremonial weapon of the Swiss Guard in the Vatican.